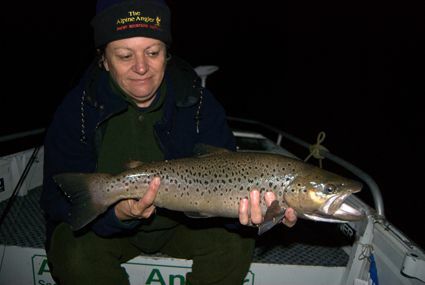 The rivers have fished well over the past week and Powerbait fishing in the lakes has been good in some areas. Rivers:- Have been fishing well with the Eucumbene and Thredbo rivers holding good numbers of fish with plenty of rainbows amongst them. There have been plenty of reports of anglers seeing large browns in both rivers. Eucumbene has been fishing well with beadhead nymphs and woolly buggers while anglers in the Thredbo report glo bugs as being the best. Other streams like the Gungarlin and the upper reaches of the Thredbo have produced some fun fishing on smaller size rainbows too. Lake Eucumbene:- Fly reports have varied over the past week. Daytime fishing has genereally been the best with the evenings and night time fishing a little slow. 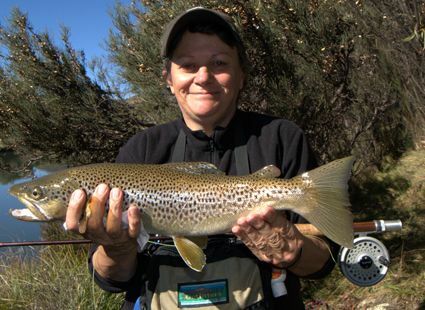 *Below is super keen fly fisher, Donna Cardwell from The Mitta Valley in Victoria with some very nice brown trout taken fishing the Jindabyne area on the weekend. Rainbows are loving Powerbait in the Buckenderra arm with several anglers catching their bags. Lime twist has been a favourite but the half a grub and powerbait cocktail has been an excellent bait.